Hunters can agree, that the best hunting blind should have a great camouflage design, be the correct height, and accommodate the right number of people in order to be perfect for you. Those are the top criteria that we used in selecting the best hunting blind. The Big Cat 350 hunting blind scored high marks in all categories and is our top pick. 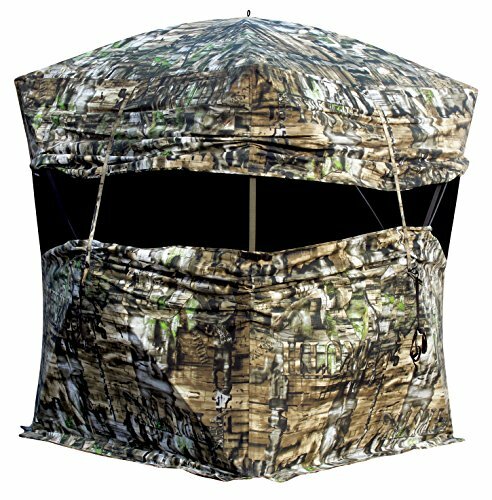 A hunting blind allows you to hunt in comfort, while also concealing you from your target. No matter what whether conditions, terrain, or shooting style, you can find a hunting blind that suits various different circumstances. This guide is meant to help you to find the hunting blind that is just right for the conditions under which you usually hunt, making the experience more enjoyable and successful. Once you find the perfect blind you’re going to see that hunting is more effective than it was before. Whether you’re a professional or someone who is new to hunting, you can experience the benefits of owning a high quality blind that is easy to take on the go. The best blinds are going to be made from durable materials that will stand the test of time, while also being lightweight enough to carry from place to place with ease. Lets take a look at the top rated hunting blinds, as these are a great starting point for your journey. The Big Cat Hub Blind is the ideal choice for hunters who don’t want to take up so much space but still want a tall design that allows them to feel comfortable inside. In fact, this blind has a much smaller footprint, but gives you the headroom that you need to shoot comfortably and accurately. The camouflage design makes this blind discreet and undetected by animals, so that you can get the best view while being perfectly concealed. If you’re into archery, this blind is perfect because it allows you to fully stand up inside. There’s a replaceable shoot-through mesh camo window for the ultimate in broadhead use, and also a durable five-hub design that makes this blind easy to set up and take down; all you do is simply pop up and start hunting. It’s easy to take this blind on the go, and the brush holders give you even more concealment. You get everything that you need when you purchase this blind, including gear pocket, tie down ropes, and ground stakes. Just because you’re hunting doesn’t mean that you should be uncomfortable. 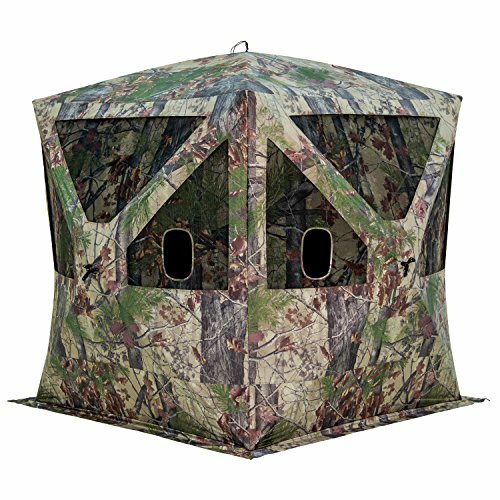 This hunting blind from Ameristep gives you a large front and side zippered windows so that you always have good circulation of air, while having a nice view of your target. The backpack carrying case allows you to take this blind on the go with ease, and it even includes a double wide chair so that you can hunt in comfort. 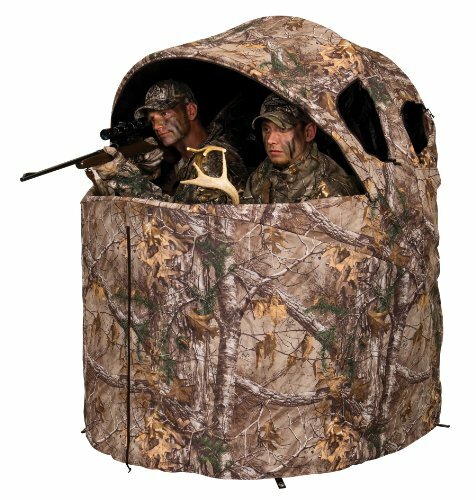 You can set up this blind in three easy steps, making it ideal for those who like to hunt on the go and travel from place to place. This blind comes with the traditional camouflage style, making you invisible to your target while putting you in the perfect proximity to your prey. This is one of the best blinds on the market and is ideal if you have one hunting buddy that you’re always out in the field with, or if you’re just a large person that likes a little extra space in your blind. If you’re a man that likes space, then this hunting blind from Primos Hunting is going to be just right for you. Constructed from high quality materials, this blind is sure to stand the test of time while protecting you from the elements without showing any signs of wear and tear. It’s tested to withstand even the toughest situations and environments, so that you can feel free to go out even in harsher weather conditions. This blind is designed not only with professionals in mind, but also for recreational hunters and those who are just learning. The ample base makes this an extra large blind that is ideal for multiple users, or for individuals that just want a little leg room. It’s also extra high for those who are tall or want to stand fully upright while shooting. All in all, this is a fantastic hunting base for the large hunter, or for the guy that just needs some elbow room. Finding the right hunting blind is easy once you know what you’re looking for. There’s plenty to choose from out there, but you can narrow it down by asking yourself some key questions about your hunting style and where you like to hunt most. The above top rated hunting blinds are a great choice for most hunters, but if you want to keep looking then the following buyer’s guide is going to help you to find something that is just right for you, enhancing your hunting experience and your success out on the field. What is a Hunting Blind? When it comes to using a hunting blind, you have a lot of choices. There are a number of different models out there and it can be confusing and overwhelming to choose the one that is just right for you and your shooting style. Lets explore what you need to consider before you make the choice and purchase a blind for yourself and your buddies. Lets start with the basic questions. The obvious reason to buy a blind is to conceal yourself from your prey. But there are many other reasons that purchasing a hunting blind is a smart choice. Really, it gives you the ability to move. If you want to pick up and move to another spot, or if you’re hunting with someone who has never done it before, a blind allows you to move around a bit without your prey seeing you or noticing. Also, if you have family in tow, it’s possible to keep a child or other family member out of sight while you do your hunting. Sharing time with a child in the woods is a great bonding experience, but it’s important to keep them safe and concealed while doing it. What Should You Look for in a Blind? This is another great question, and the answer really comes down to portability. Should you want to use your blind all year round, then you need to look for something that is weather-proof. Keep in mind that these blinds can be used all year round, but they’re still made from lightweight materials and that means that they’re going to show signs of wear and tear eventually. If you really want to use the blind out in the elements then be sure to look for something that specifies that it is for all-weather use. You also need something that is completely portable and can be moved from place to place with very little effort. What Will you be Doing with your Blind? Using a blind makes it possible to hunt deer and other big game animals including turkeys, waterfowl, and so much more. Take into account whether you’re going to be hunting with a bow or a rifle, as some blinds are good for both while others are more specifically suited towards either one. Make sure the blind is suited to your particular style of hunting. With the Camo Pattern Fit Your Hunting Area? There are lots of choices of camo patterns out there, so you need to know where you’re going to be hunting to make sure that it’s a good fit. You want to pick something that is the right coloring, but there are some patterns that will generally fit no matter where you’re going to hunt. Some blinds are even reversible so that you get two totally different patterns on either side. When it comes to choosing the right pattern, versatility is always a good way to go. Spring steel is used for ‘pop-up’ blinds, and they’re a quick and easy way to get a blind set up. When you release the frame it pops into formation, and it’s very lightweight and easy to take on the go. You quickly set it up and then stake it into the ground within minutes. The problem with these is that the steel design isn’t quite as tolerant to weather conditions. If you have a strong wind then it will push the blind around, and snow can even cause it to collapse. However, if you’re a fair weather hunter, then this is a good choice. Frame blinds on the other hand are a lot heavier and are quite rigid. This means that they can withstand the elements a lot better. They’re easy and fast when it comes to setup, and some are just as quick as spring steel models. The only downside to these is really the weight, because they’re heavier to transport from place to place, but they’re mostly still quite compact. If you know that you’ll be hunting in a high-wind area, then you certainly want to look into a frame blind as it is more rigid and will blend in better in a windy environment. The type of hunting that you engage in is going to play a huge role in what kind of blind that you purchase. Take for instance rifle hunting. There are specific blinds that are perfect for this kind of shooting, and then there are blinds that are more geared towards using a bow and arrow. If you’re an archer, then you need enough room to pull the bow. Look at the dimensions of the blind and even try to find a model to step inside before purchasing. Some blinds are designed for shooting from a kneeling or sitting position, while others allow you to stand up fully. Take into account what position is most comfortable for you while you’re shooting and find a blind that makes this possible. One great idea is to write down the dimensions of the blind that you’re interested in and then tape-down these dimensions on the floor and give it a test drive. Also consider whether you have a favorite hunting buddy that you’re going to be using the blind with. There are blinds that are designed for more than one person to comfortably shoot at the same time. It just takes a little planning in advance to know what size is going to be the best for you. If you want versatility, then it’s always a great idea to go big, but keep in mind that this may make the blind harder to set up and transport. One thing to consider is that you want to practice setting up your blind before you take it out to shoot for the first time. You want to practice with it for a bit till you get the hang of it. Practice your archery shots from whatever position you usually shoot in. Most blinds these days use a window system so that you can shoot through a screen mesh without hindering the flight of the arrow. This keeps you concealed while effectively shooting at your target. You can replace these window screens, and they’re also pretty inexpensive. The screen will also have the same camouflage design as the rest of the blind. Animals will effortlessly walk right by the blind without noticing it, and this puts you in the perfect place to take a great shot. There are even some scent-resistant blinds that make it so the animal cannot smell you from behind it. There are various camouflage patterns that you have to choose from. There are many blinds that will come with an all-purpose design pattern that blends into whatever situation you find yourself in. Some blinds will allow you to tailor the design for whatever area you’re going to be shooting in. It’s possible to find a blind that is designed for highly specialized areas where there are a lot of conifer trees, or ones that are meant for the open country. Rolling grasslands and prairie regions will require a specific kind of design pattern. The last thing that you want is a blind that stands out, so be sure to put some thought into what is going to suit the situation. The wrong kind of pattern can even spook game, which you definitely don’t want. More so on the market you find reversible blinds, and this gives you more than one pattern choice. You get two different camo designs on one blind. By simply pulling on the zipper and quickly flipping it, you have a whole new look. This kind of versatility is great for hunters, and it means that you don’t have to carry around more than one blind. By asking yourself the right questions you can figure out the specific blind that you’re looking for, and then you just need to practice a lot with it till you get the hang of it. Being able to work with a blind makes you a versatile hunter, and will give you better chances out on the field. If you can move a portable blind around without spooking game then you definitely have the advantage in the situation, and mastering the use of a blind will make hunting more enjoyable. Knowing how to use a hunting blind gives you an incredible advantage out on the field, but like with everything, it just takes a little practice. You want to know how to shoot in a blind, but you also want to learn how to set it up and move it without calling too much attention to yourself and spooking the game. Finding the right hunting blind requires you to ask yourself some key questions about how and where you’re going to use it, as well as what shooting style you prefer. Blinds come in all different styles, shapes, and colors, so you need to know the specifics about how you hunt. When you’re ready to buy a blind, it’s a smart choice to read reviews online so that you can see what models really work best for customers. You also need to take into account what kind of climate you’ll be hunting in, as this is a big determining factor.